Anthony Edwin Anaclerio (1904-1981) was born in or near Palermo, Italy, and christened Antonio. He immigrated in 1905 with his mother “Rosy” and two siblings, preceded the year before by his father “Frank,” and the family showed up in the 1920 census living in Berkeley with two more children born in America. At that time “Tony” and his older brother Charles worked at California Foundries with their father, and his mother was a clerk-typist at a syrup factory. 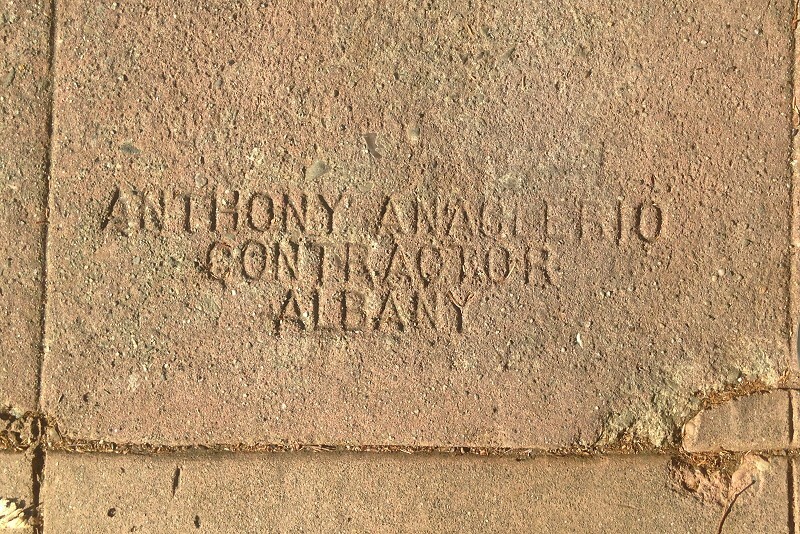 He rose in the world to become a contractor working in the fresh air, and sidewalks stamped with his name are found all over Berkeley, dating from the 1950s and 1960s (thanks to Hannah Berman’s long-inactive Sidewalk Secrets blog for that documentation). And Lincoln Cushing has recorded another example in Albany. While I can supply a few bare facts about guys like Anthony Anaclerio in a blog like this, it takes a poet’s song to evoke their living lives. And my few notes here aren’t really that important, any more than Anaclerio’s name, chosen for its rhyme. The point is that he’s an emblem of hundreds of sidewalk makers who helped build our East Bay by hand, square by square. That was their craft and their trade. I bow to them wherever I walk. And I keep in mind that their work may outlive mine. This entry was posted on 15 December 2017 at 8:02 am and is filed under Profiles. You can follow any responses to this entry through the RSS 2.0 feed. You can skip to the end and leave a response. Pinging is currently not allowed. This post marks the end of regular weekly posts from me. I’ll take a break for the rest of December, then starting in January I’ll post every now and then when inspiration strikes. See more in my latest comment to the About page.